Archaeologists working on a rescue excavation in Athens city centre have just announced the discovery of a series of clay tablets inscribed in the Linear B script, the first to be found in the city. The tablets date from the end of the Bronze Age, c.1200 BCE, and provide exciting new evidence for ritual practices in Mycenaean Greece. According to the excavation director, Professor Ilithios Apriliou, the texts refer to a ritual taking place on the first day of the month Apate, tentatively identified as the fourth month of the Mycenaean year. Participants in the ritual are recorded as receiving varying quantities of barley, while other tablets list offerings of wine and olive oil to the god Hermes (Hermahas in Mycenaean Greek). The most enigmatic of the tablets appears to act as an introduction to the whole series; while much of its text is currently obscure, Prof. Apriliou believes it describes a part of the ritual in which participants compete to tell the most outrageous stories in honour of the trickster god Hermes. The tablet is, however, badly damaged, and this interpretation relies heavily on Prof. Apriliou’s suggested restorations; an alternative reading, in which the festival is simply opened by a council of elders, is equally possible, and only close further study – and, it is to be hoped, further discoveries of tablets – will reveal the true nature of this mysterious ancient celebration. Update: some helpful explanations (and a few more classical news items from April 1st) here! Just before Christmas I was lucky enough to go on a research trip to Greece, where I spent a happy couple of weeks in various museum workrooms. 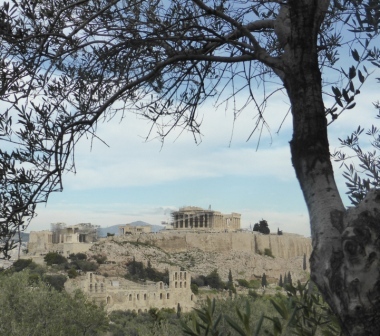 Naturally I also managed to get in some sightseeing around Athens (helped by the fact that Greek museums are only open for work until 3pm), so I thought I would share a few tips of things to do/see for any RG readers who may be visiting in future.